I love using pink and my life has been very touched by breast cancer (not personally) so it was an obvious choice to join a Swap-Bot swap for a breast cancer themed ATC. I absolutely LOVE the background swirl stamp (Tim Holtz). He has put it into several sets I believe. No wonder, it is gorgeous! The rest is pretty obvious so not too much to say. Hope you are all having a fabulously fun and safe summer! the ATC looks great, the beads on the butterfly look so dainty. would be a great decoration, and good for starting conversation and getting attention for a good cause! Lovely! 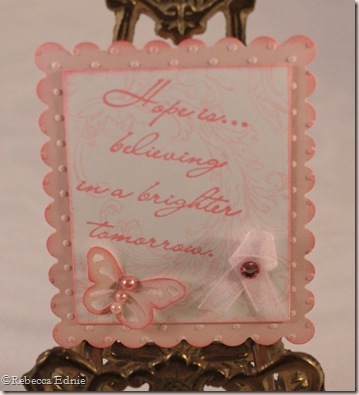 You can't go too wrong with Tim Holtz! gorgeous..will have to try that nestie for atc too!